Online shopping malls are all the rage these days. Retailers know that miles are a great way to encourage shoppers (color me guilty) and often offer huge bonuses to increase sales. Once you keep the Shopping Assistant for at least 30 days and you get your free miles, you can uninstall it. Unfortunately right now it’s only available for Windows XP, Windows 7, Windows Vista, but the Mac version will be available December 1, 2011. It says miles will be posted 10-12 weeks after the promo ends on 12/31/11, so don’t expect the miles anytime soon. However, free miles are free miles! Hat tip TPG reader Paul! 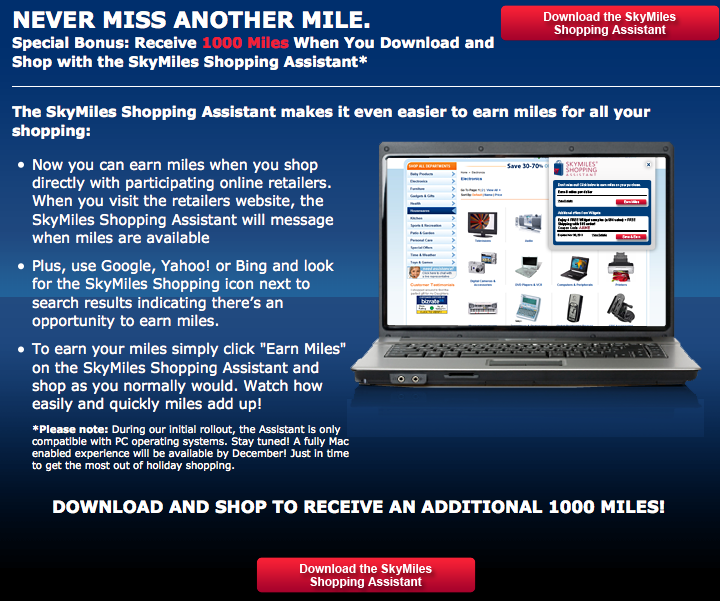 **Now through 11:59 pm EST, December 31, 2011, download the SkyMiles Shopping Assistant and keep it installed for 30 days to earn 500 miles. Spend a total of $250 or more with the SkyMiles Shopping Assistant by December 31, 2011, and earn an additional 500 miles! Returns, taxes and shipping fees are not eligible for miles. Please allow 10-12 weeks after the close of the promotion for your bonus miles to be deposited into your account.